-Guest Post by the one and only Dany Hoter ! We Excel geeks aren’t spoiled with fancy query builders. We have had MSQuery for the last what? 15 years? Suffice to say it is a tool from the class of Access 1.0. Not only it looks very old but on the technical side it only supports SQL features which existed somewhere in the late 80’s or early 90’s. If you followed the posts on this blog and others about PowerPivot you heard a lot about DAX calculations and creating relationships between tables and about using the tables in PP to create nice looking presentations. What you haven’t heard so much about are the query designers. Maybe it is because this feature doesn’t look so special for someone coming for the world of SQL Server Reporting Services (SSRS) and SQL Server Integration Services or just plain Visual Studio development. For us the lowly Excel users the possibility to use a decent query designer for creating complex SQL queries in a drag and drop fashion is a very significant improvement. Is it the time to remember your (extinct (?)) SQL skills or maybe paste a SQL statement you generated in SQL enterprise management? This is what I thought too and I actually did paste SQL syntax generated by a foreign tool (Business objects but please do not tell anyone about it). Only later I noticed the button on the bottom right saying “Design” and gave it a try with very low expectations. The relationships were discovered automatically by the designer based on constraints in the database. This settings will result in 0 rows retrieved because it requires that all three dates will be the same which is very unlikely. You can delete 2 out of 3 relations and chose the Date dimension that is best. You can also edit the SQL syntax and join the DimDate a second time. I couldn’t find a way to do that in the graphical designer. 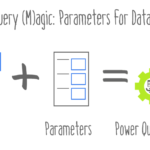 Notice that once you edit the graphically designed query, you can’t go back because the wizard will discard your query and you’ll have to start over. Notice that the option for parameters is not implemented in this release. A nice touch is the option for creating multiple choices by clicking on the + sign in the edit control. Unfortunately there is no list of values and you have to know the value you want to filter on. At any point you can run the query and see the results. You can generate aggregate queries by clicking the Group and Aggregate button and changing selecting some fields for the aggregation. Any other field in the query will automatically be part of the group by. From the PowerPivot menu you can use table properties to enter the designer again. Before we see the AS or MDX query designer we should ask ourselves why do we need to bring data from a cube into PowerPivot. Aren’t we making a multidimensional object into a flat table just to make it again a multi dimensional object ? At this point I’ll give just two reasons why this exercise can be useful. Bringing data from two or more separate cube on potentially more than one server. From here you are basically in Drag&Drop heaven. You can drag measures, fields , whole hierarchies , a whole dimension etc. You have lists of values and hierarchy navigation while choosing values. One important word of caution about calculations. The calculated members from the cube will be transformed to regular fields with fixed values once brought into the PP environment. Any dynamic nature they have will be lost. Another word of caution is about security. Unless you publish the PowerPivot with data open for everyone and force the user to refresh the query using her own credentials, you risk breaching cube security. If you query using the credentials of a user who can see all the cube and give other users the right to open the Excel workbook, they are going to see all data until they attempt to refresh. This is not different from sharing a static report or a regular Excel pivot that does not refresh on open. These two designers are a reason enough to start using PowerPivot , don’t you agree? I found the query design tools a bit backward as well when compared to other tools like for instance Reporting Services. In Report Builder it is just the opposite like you want it when the graphical interface is displayed first. When I first wanted to get data from Analysis Services I was expecting an interface like the one pulling data from SQL Server and got the Specify MDX Query window and thought I was doing something wrong. I also finally saw the design button and then was disappointed a bit (guess I wasn’t sure what I would really was expecting). Just an FYI, I had an issue in my IE8 where the Edit Related Fields image was being displayed on top of the blog posting text (second image in the Table Relationships section). I had to open it up in another browser…Chrome (don’t tell anyone…) and it displayed just fine. Weird. Might just be something on my end, not sure, but wanted to let you know. Why can’t I go back into the Table Import Wizard for an already existing PowerPivot? Try the Table Properties button. It’s on the second ribbon tab in the PowerPivot window. After designing in the table import wizard I have went to the table properties to edit the table. Now it wants me to edit the query via text instead of the wizard. Any chance I can edit my existing query in the wizard? In the dialog that shows you the text there is a Design button that will take you to the designer..
i have the same issue but have no idea how I “changed the query before in it’s text form” to make it like this forever? what can I do to prevent this from happening?